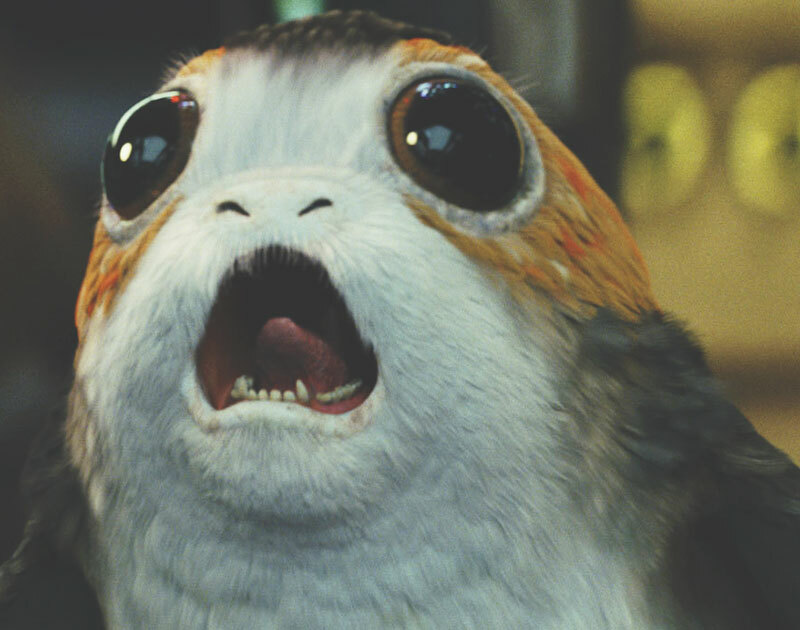 The Last Jedi Brings Some Needed Firsts To Star Wars. By Foregoing The Fan Service That Bogged Down The Force Awakens, The Last Jedi Becomes More Powerful Than You Could Possibly Imagine. Cast: Daisy Ridley, John Boyega, Oscar Isaac, Adam Driver, Kelly Marie Tran, Mark Hamill, Andy Serkis and Carrie Fisher. With The Force Awakens being J.J. Abrams’ best copy-and-paste work to date and Rogue One being an interesting story filled with flaws, it’s safe to say that the Disney phase of Star Wars has yielded mixed results. Still, with acclaimed indie film and TV director Rian Johnson taking over the helm for The Last Jedi, expectations were set pretty high heading into this latest installment in the blockbuster franchise. And why not? Not only is Johnson a Film Twitter darling, but his works (Looper, Brick) are filled with both humor and humanity on a deep level. People had plenty of reason to be excited about his vision of the Star Wars universe. And they’re going to be pleased with the final result, too: The Last Jedi will go down in history as one of the better entries in the Star Wars franchise. Picking up immediately after the events of The Force Awakens, The Last Jedi sees the Resistance grappling with the loss of the Republic as a financial backer and supporter, depleted in resources and on the run from the First Order after their base is discovered. Meanwhile, Rey (Ridley) confronts a disheartened and defeated Luke Skywalker (Hamill) in Ahch-To, where he has exiled himself in the wake of Ben Solo turning into Kylo Ren (Driver) and remains none too eager to come back into a giant galactic conflict. OK, so from that, it all sounds a lot like the Empire Strikes Back, right? A rebel force on the run from the evil Nazi-esque villains? Check. An over-eager student seeking out an unwilling teacher? Check. But that’s where the similarities end. With The Last Jedi, Johnson manages to bring inject his own voice into the gargantuan franchise. Instead of feeling like a remix of a prior movie through stringed-together set-pieces, this one tells a deep character story. Whether it’s the inexplicable lack of innovation in starship designs or the franchise’s obsession with blowing up planets with moon-sized weapons, Star Wars films have long been held back by their thematic and aesthetic reliance on the Original Trilogy as source material. But, while it certainly plays a role in the greater arc, The Last Jedi shines because embraces new concepts in story, in setting and in presentation. Visually, it is the most awe-inspiring blockbuster spectacle of the year — truly, some of these shows deserve to be in a museum. And they’re not just empty visuals either, as the beauty is paired well with the emotional weight of the plot, which, as anticipated, centers around Rey and Kylo Ren as they embark on dueling philosophical journeys that are spurred on by their respective teachers, Luke and Snoke (Serkis), who urge them to let go of their pasts. That seems to be Johnson’s aim here, too, as his script takes certain characters in directions that fans might not yearn to see. But credit where its due: If the knock on The Force Awakens was that it played too much into fan desires, The Last Jedi acts as a fitting about-face; this film will very much take certain fans by surprise. But that’s also why it succeeds. The Last Jedi is, put simply, blockbuster film-making at its finest. It will stick with you, it will make you laugh, it will make you gasp and it will make you cry. It will make you feel all of the feels. And when a Star Wars film can do that, that’s a very good feeling indeed. Previous ArticleWanna Be On The Mavericks’ Official NBA 2K Team? Next ArticleHorchata Is Here To Save The Day.